Mickelson Musings – The Real Superbowl, Chocolate, and Free IHRSA Passes, and more! 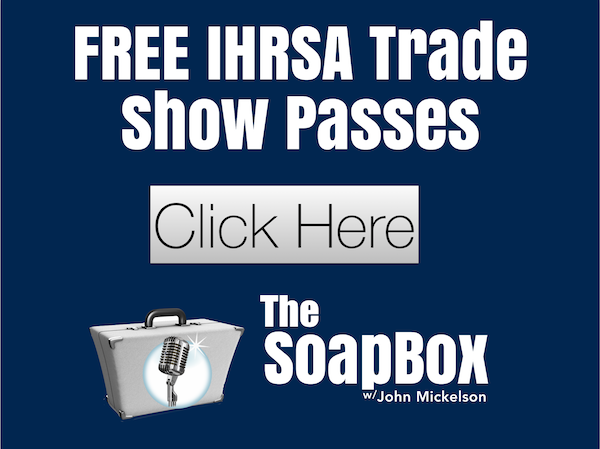 IHRSA is almost here. The Superbowl of tradeshows. An opportunity to see old friends and make new ones. I’ll be in the Petra-1 booth (booth 617) looking forward to meeting all of you who stop by. It’s all about the relationships and it’s pleasure and privilege to spend time with you when you take time out of your busy schedule to stop by. We even made it easy to attend by providing free entry into the tradeshow. Click on the graphic below this write-up, fill in the blanks and you will receive confirmation that you are signed-up and ready to go. Just another example of how John Mickelson makes things easy for you. As most of you know from past issues of the Soapbox, we like to give back. We have done several articles on Augie’s Quest in the effort to support the discovery of a cure for ALS. I would encourage you to join me in attending. Please review the article and give your support as you can. The article provided by William Ryan about our unique “Foaming Hand Sanitizer” is a testimonial to the way Petra-1 formulates and manufactures our products. William Ryan suffers from chronic eczema and his journey to find relief has been successful by using the Petra-1 AC 585-F Foaming Non-Alcohol Hand Sanitizer. Not only does our foaming hand sanitizer exceed the performance of other hand sanitizers but we are about 40% less expensive than competing brands. Let us prove the performance of this unique hand sanitizer and allow me to send you a sample. Send me an email with your contact info and I’ll provide you a free sample to try. I make it a point when meeting people to provide a gift to demonstrate my appreciation for giving me time during their busy schedule. The gift is a box of chocolates from Woodhouse Chocolate. Woodhouse Chocolate is an upscale chocolate shop in Napa Valley, California, popular with celebrities such as Steven Spielberg and Oprah Winfrey (mentioned more than once in her list of favorite things). The article/content is provided by John Anderson the owner and certainly worth of your time to read. If you have not been a recipient of receiving a sample box of Woodhouse Chocolates, send me an email with your contact info and I’ll gladly provide you a sample. As Consumer Report Magazine highlighted in a past issue, Woodhouse Chocolates are the “World Best Chocolates”. MACMA (Maryland, Virginia, Washington DC, Delaware, Pennsylvania and New Jersey) and Fitlife (Pacific Northwest) are two IHRSA regional organizations that support clubs in their geographical area. Their desire to provide support to independent facilities is a labor of love and I encourage you to contact them and learn more about how they can help your club become more profitable and improve the membership experience. They have provided content on special offerings and worthy of your time to read. I appreciate you taking the time to review this issue of the Soapbox and should you have suggestions on content or would like to chat, please email me and lets make it happen. Passcode autopopulated when using the link above.